So… This is version 6.0.2.56680. It has some new features. 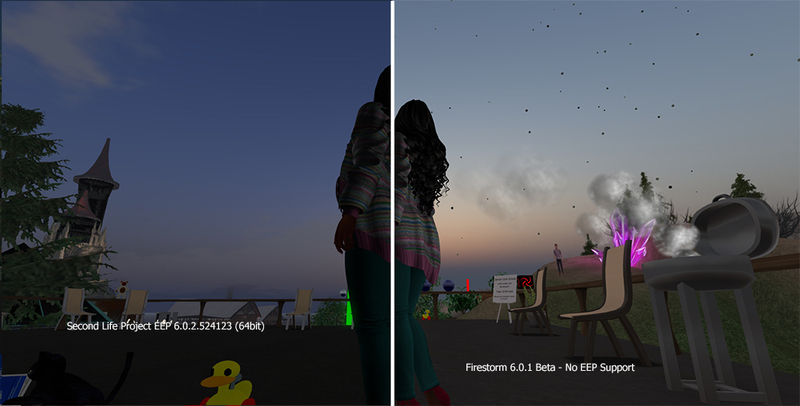 Inara has a couple of writeups about the two Animesh versions of the viewer, FIRESTORM 6.0.2: ANIMESH RELEASE (this release) and Firestorm 6.0.1: Animesh Early Access (the previous release). Check those writeups if you want lots of details. Otherwise… Besides Animesh, we get a few fixes, about a half dozen I have never run into (see release notes). The ‘splayed hands’ problem has a fix. Some install parts of the viewer updated; all the Linden 6.0.1 fixes and additions, changes to the code playing sound, the code handling the images – Kakadu – was updated, and the OGG library that has to do with… audio compression of files, you know the sound files we upload versus voice. Posted in Firestorm, Second Life, Viewers. Second Life: Android and iOS? What is the Lab thinking? Seems many are excited about Brad & Oz Linden making comments about development of an app for iOS and probably Android. Inara has been writing about it at Modem World. And Hamlet picked up on that posting LINDEN LAB CONFIRMS. Hamlet adds a bit of speculation. But, Inara makes the most speculative guesses about what the Lab is doing. She is knowledgeable and her guesses are those of a person well informed on and experienced in the subjects of Second Life and Linden Lab. I think they are reasonable. I’ll add an additional twist. Consider. The people using and requesting mobile apps for SL are existing users. The current mobile apps provide a means for existing SL users to manage business tasks while on the move. Posted in Second Life, Viewers. Tagged Mobile, Virtual World News.